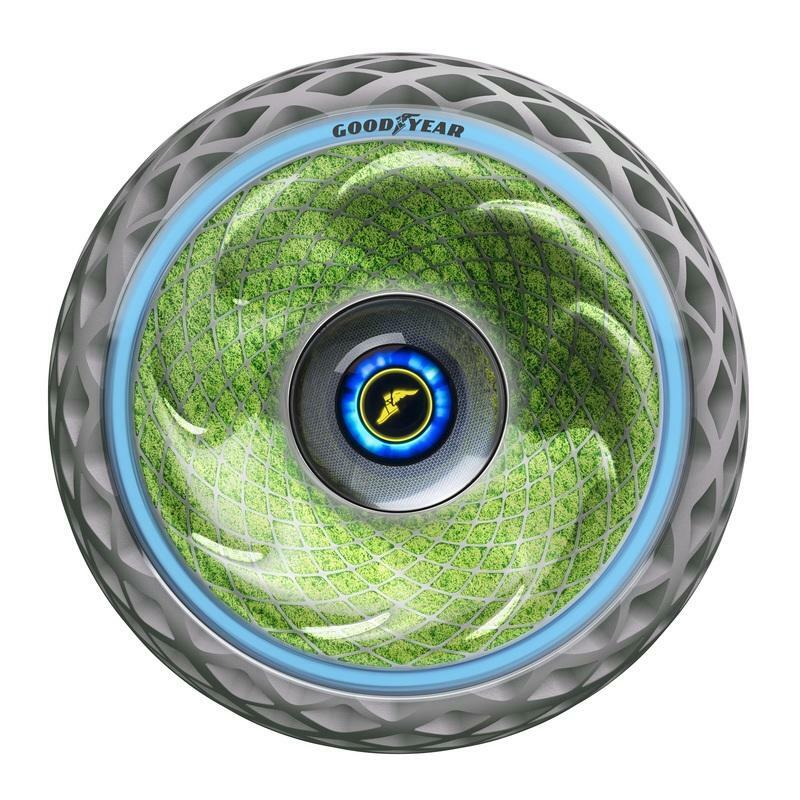 Feast your eyes on Goodyear’s Aero Tiltrotor Tire Concept, a tire that turns into a propeller! The Geneva Motor Show was filled to the brim with concepts. There were supercar concepts, EV concepts, luxury car concepts. You name it, they were there. But, believe it or not, the coolest concept that was on display at the show might not even belong to an automaker. It’s called the Aero Tiltrotor Tire Concept, and it comes from Goodyear. 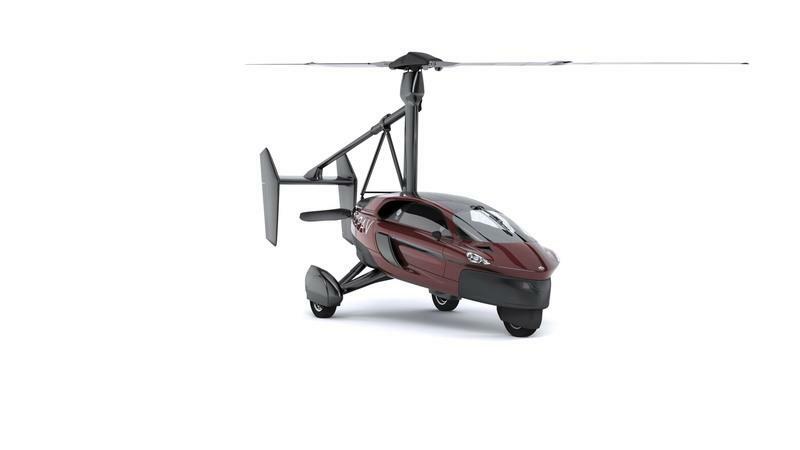 While it looks like a traditional tire, the Aero Tiltrotor Concept is far from a traditional tire. It can serve the usual purpose of a tire, albeit without any air in it, but it’s more important feature is its ability to turn into a propeller for flying cars. Yep. 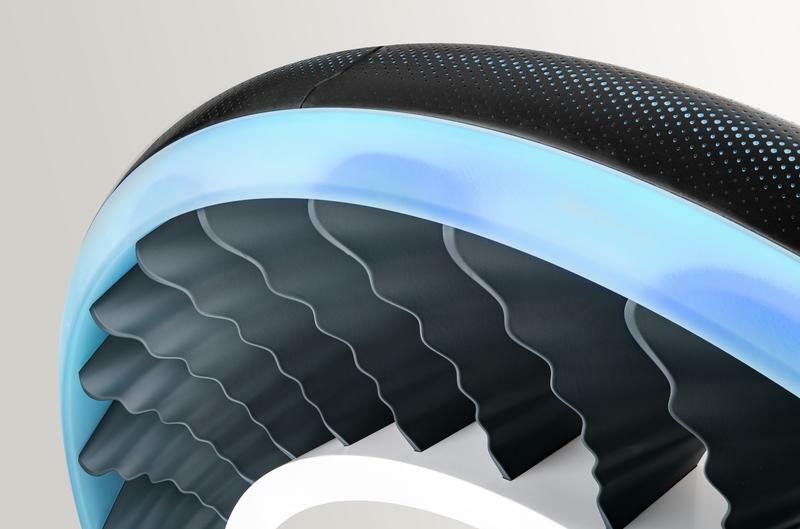 It’s a tire that doubles as a propeller for flying cars. All those dreams you had of one day driving a car that could fly like Doctor Emmett Brown’s DeLorean could turn to reality if these tires end up in production. That’s probably not happening soon, but the thought that a concept version of one now exists is pretty darn cool. I’ve always thought that tire concepts don’t get as much love as they deserve. They are, after all, the reason why cars move in the first place. Forget about top speed records or anything of that sort because, without tires, cars don’t move. So, yeah, I champion for more tire concepts to get more attention than they do because they deserve it. Fortunately, Goodyear’s new tire concept doesn’t need me to act as a hype man for it because Goodyear’s already on point on it, simply by developing it. This, ladies and gentlemen, is the Aero Tiltrotor Tire Concept, or as I’d like to call it, the tire concept we’ve all been waiting for. If I can get technical for a second, here’s how the Aero Tiltrotor works. The concept features a bimodal system where the tire can act like a normal tire when a vehicle is on the ground. Sure, it’s got some wheezy new-age tech to it, including its non-reliance on air that works because the structure inside the thin tire is non-pneumatic. While it sounds cool, this feature isn’t exactly state-of-the-art technology. A lot of small vehicles, including lawn mowers and motorized golf carts, use non-pneumatic tires. Heck, even the U.S. military has dabbled on non-pneumatic tires in the past. But the application of the technology on actual cars is new, which is pretty cool in it of itself. But that’s not what makes Goodyear’s Aero Tiltrotor Tire Concept special. That falls in the concept’s second function, or mode, or whatever you want to call it. Goodyear’s new concept tire can also tilt 90 degrees with the outer wheel facing the earth. In this state, the wheel and the spokes that support the tire on the ground spin like a propeller, lifting an entire car in the process. With one tilt-rotor tire on each corner of a car, the same car essentially becomes a quadcopter. I’ll repeat that more emphatically. The car becomes a freakin’ quadcopter. Now, I know what you’re thinking. You’ve seen something like this before. Sure, I’ll accept that reasoning if you admit that the only place you’ve seen this kind of tire technology is in front of a TV or inside a movie theater. Memories of Back to the Future suddenly rushing back in? But to see something like it in the real world where time-traveling cars or superheroes with superhuman abilities don’t exist? This is next-level tire technology, folks. In the event Goodyear manages to perfect the technology and make the tires operational, the idea of a flying car suddenly becomes more real than it’s ever been. Granted, here’s the rub. “If” is a strong qualifier, particularly in this context. As cool as the Aero Tiltrotor Tire Concept is — it’s awesome beyond words — getting it to actually work in a real-life setting is the real challenge. I’ll give Goodyear credit here because it’s clearly thought about how to make this concept work, including possible applications that could be used to get it to work in the way it was developed to do. According to the tire maker, magnetic propulsion could, in theory, at least, lift a car off the ground using these tires. The technology to test that theory out already exists, but no one, not even Goodyear, believes that the tech is advanced enough to actually make it work. Artificial intelligence was also thrown in as a possible factor in the concept's development. AI would be able to analyze various data and real-world conditions and communicate that information to the car, which, in turn, could “instruct” the tire to turn on its side and act as a propeller. It sounds silly to even think about, especially when you’re trying to find ways to get the tech off the ground, no pun intended. Ultimately, I don’t think we’re there yet. As cool as it sounds, Goodyear’s Aero Tiltrotor Tire Concept will probably remain a concept for a while. It’s not that I don’t think the tire maker is capable of achieving the technological advancements necessary to make the concept work; it’s that even with its expertise, there are still too many unanswered variables that need, well, answers. 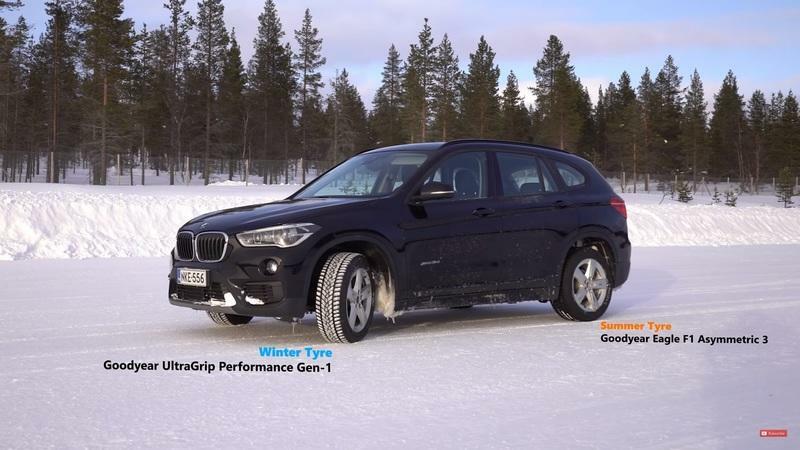 It’s not unlike the company’s other concept tires, including the Eagle-360 or the Oxygene Concept. All these concepts are awesome on the surface. They point to an incredible future for the auto industry. But before we get to that “future,” we have to work on the present. That’s what Goodyear has on its plate now, as does every other tire maker in the world. Still, even if the Aero Tiltrotor Tire Concept is still more fantasy than reality today, that shouldn’t stop us — or Goodyear, for that matter — from wondering if today’s fantasy does become tomorrow’s reality. Meet the Goodyear Oxygene, the Tire That Makes Oxygen!